The winning entry was an impeccably crafted Clear Heart Redwood deck in Graton, (near Sebastopol) California. “We selected the best vertical grain and quarter sawn clear redwood we could find for the decking and attached it from below using Deckmaster Hidden Brackets. That way the floor surface is unmarred by unsightly nails or screws” said Leavens who invented and patented the Deckmaster system. 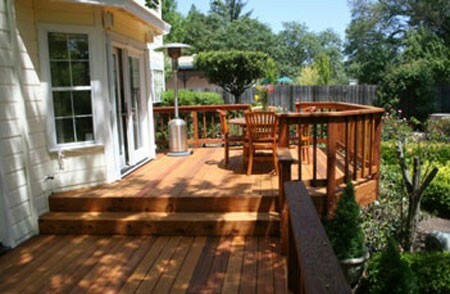 “We also, notched the posts to receive the 2×4 rails which gives the deck a furniture grade appearance.” he continued. A longtime environmentalist, Leavens employed a number of Green building techniques and products in this project starting with the demolition of the old deck. Instead of chopping up the old deck and throwing it into a landfill, each board was carefully removed and de-nailed. An ad on Craigslist located a company that re-uses redwood for deck and fence repairs. “One of the beauties of redwood is that even after the deck has worn out, many of the deck boards are still sound and can find new life in other applications” said Leavens. 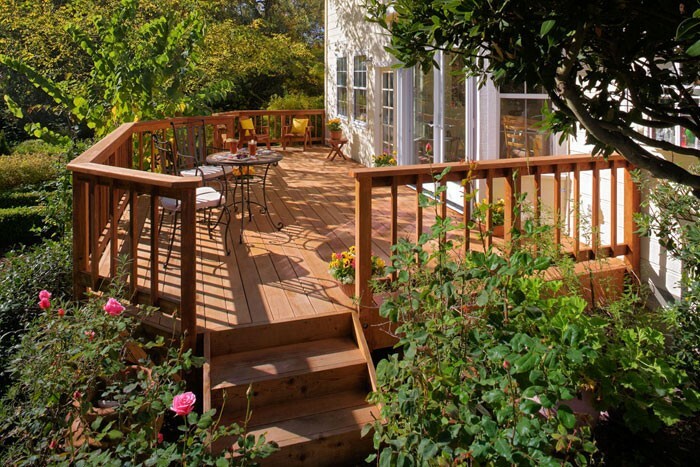 The best way to build a “green” deck is to make it last longer. 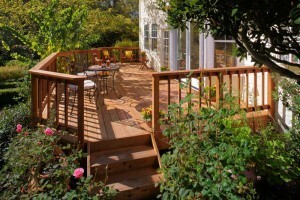 Decks in Northern California usually fail and need replacing when they are between 20 and 30 years old. However, Leavens is confident that decks built today using top quality materials and construction techniques may easily last 100 years or more. 2) rot along the ledger attachment to the house. The Deckmaster Hidden Bracket avoids the first problem by attaching the deck boards from below. The second problem is solved by using “Deck to Wall” spacers. These plastic spacers (invented by a Petaluma deck builder) hold the ledger ½” away from the house wall and prevent rot due to water accumulation. The winning deck also employed Ground Contact Rated Pressure Treated Douglas fir understructure. All hardware was heavily galvanized, powder coated or otherwise ACQ compliant to hold up to the chemicals in the wood and the worst elements that Mother Nature can throw at it. The finish was SuperDeck Natural deck stain which protects against UV radiation and gives the wood a tougher surface to help withstand driving rain. There were no nails used in the construction of this deck. When wood dries and shrinks, nails loosen and lose their ability to hold. Good quality screws offer much more permanent holding power. “The image of a deck builder swinging a hammer does not apply to us. Our hammers mostly gather dust while our screw guns work all day long” Leavens explained. In order to hide the treated understructure and avoid seeing the end grain of decking, this deck has 2×12 vertical fascia mitered at the corners. “The quick and easy way to finish a deck is to overhang the deck boards and leave the ends exposed. Adding mitered fascia takes time and skill but the results are worth it” added Leavens. While pleased to receive local recognition, Weston Leavens has a long history of besting the competition. 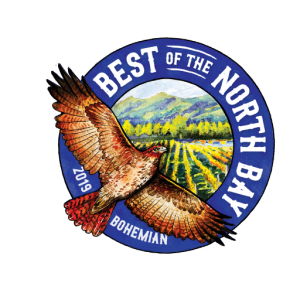 In his 25 years as a deck specialist, Leavens was a winner in the National Redwood Deck Contest (also sponsored by the California Redwood Association) and won numerous awards at the Del Mar Fair in San Diego County. His invention, the Deckmaster Hidden Bracket spawned the whole hidden fastener revolution in deck building. 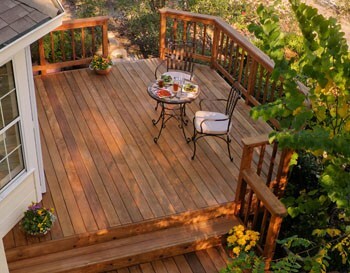 Deckmaster Fine Decks is located in Sebastopol, California and builds projects throughout the North Bay and Wine Country.